You are here: Home / lunch / sandwiches / The Best Breakfast Sandwich! Looking for the perfect bacon egg and cheese on an English Muffin? Here is a recipe for the best breakfast sandwich! Melty cheese, crispy bacon, creamy egg, with a little spinach tucked in for good measure (and don’t worry, the spinach is optional!) Who’s hungry? One of my favorite, favorite, favorite sandwiches is the classic bacon egg and cheese on a roll. You know, the same one that is on every great diner menu you’ve ever seen, and I’ve also had some terrific ones at a few fancy restaurants as well. And while I’ve done my own more exotic version of this sandwich, sometimes I just get a craving for the old classic. With a few little modifications of my own…so here we go! My first pet peeve about the bacon and egg sandwiches that you usually get at the diner is that you often have to pick between soft creamy egg and soft creamy cheese. Either they put the cheese on after the egg and nuke it so that the cheese is melted but the egg is hard-cooked, or they put the cheese on and they DON’T melt it, so the egg is still soft but the cheese is not melted. I want my egg soft and and my cheese melted, dang it! So my first modification was to use a quick and easy cheese sauce instead of the usual slice of American or cheddar. I had a hunk of Velveeta left over from the grilled cheese sandwich casserole I made a little while ago, and it melted up in two shakes with a little butter and flour. Pet peeve number one solved! My second issue is the roll that these often come on. All that bread just seems to get in the way of the stars of the show, which are the bacon, the egg and the cheese. So, I flipped over to an English muffin, which I toasted up just enough to have a little crispiness but so that it was still soft enough to bite into without it cracking. Now, you’ll notice that there is a little spinach on this sandwich. This is definitely a departure from the classic, but I had some spinach in my fridge, and it added a nice little balance to the salty bacon and cheese and the creamy egg. You can have it or not have it, depending on whether you are a spinach person or not. I’m a spinach person. So! Here’s the drill! Make your bacon first so that’s all ready to go – I find that one piece cut in half is just the right amount per sandwich. Then toast your English muffins so they are ready and waiting. If you are having spinach, saute that up next – I use baby spinach and I cook it up with a teeny bit of olive oil right on the stovetop. Next comes the cheese sauce, which takes about 5 minutes (and I know, this is a lot of pots and pans but I promise it is Worth It!). And now please take a nice big bite as soon as humanly possible. Take another. Realize that that as great as this is for breakfast, there is no reason that you can’t make it again for lunch and dinner. Be very happy. Heat olive oil in a large deep skillet over medium high heat and saute spinach until wilted. Set aside. Make cheese sauce: melt butter over medium high heat in a medium saucepan. Stir in flour, then stir in milk. Simmer until it starts to thicken, about 3-4 minutes. Stir in Velveeta until melted. Set aside. Melt butter in a large skillet over medium high heat until melted. Carefully crack eggs into skillet and cook until whites are just set. Gently flip over and cook for another 30 seconds. Remove to a plate so they are ready for you to assemble the sandwiches. 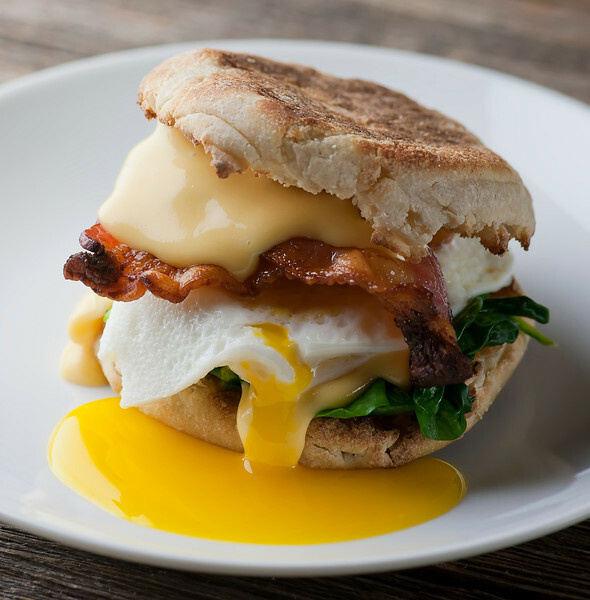 Assemble sandwiches as follows: muffin bottom, spoonful of cheese sauce, spinach (if using), egg, bacon, another generous spoonful of cheese sauce, muffin top. Take a big bite as soon as possible! O-M-G! I need this in my belly! I like how you’ve approached this egg and cheese “situation” so methodically. Definitely makes for the ULTIMATE sandwich! It was all in the name of science…and in the name of my insatiable craving for egg and cheese sandwiches! LOVE homemade English muffins – I really should make them more than I do! Only one way to describe this…perfect, just perfect! Aw, thanks!! That makes my day! I can’t resist the sight of a runny egg, this sandwich looks incredibly tasty! I know – soft eggs are the best, aren’t they? i don’t want to save this recipe… i want to save the video!! !